Astra-Glaze-SW+ concrete block is an excellent choice for institutional, commercial, and manufacturing applications because of its design flexibility, impact resistance and is virtually maintenance free. Perfect for Schools, Foodservice, Hospitals, Labs, Prisons, Assisted Living Facilities, Intermodal Transportation Facilities, Water Treatment Plants, Convenience Stores and Auto Service Centers, among others. ASTRA-GLAZE-SW®+ glazed units are concrete masonry blocks which have a thermosetting glazing compound permanently molded to one or more faces. This glazing compound is cured and heat treated in gas-fired tunnel kilns thus becoming an integral part of the unit. The glazed facings are molded in individual molds, assuring dimensional uniformity of the glazed facing regardless of minor variations in the block. 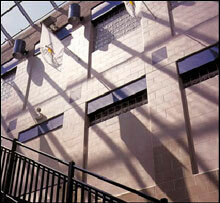 Glazed concrete blocks manufactured in Pennsylvania & Illinois are lightweight units conforming to ASTM C90 Type 1. Glazed concrete units manufactured in Arizona are mediumweight units conforming to ASTM C90 Type 1. Special manufacturing processes are used to provide a permanent, impervious satin glazed finish with exceptional resistance to staining, abrasion, impact, and chemicals. The most advanced graffiti-resistant glazed concrete masonry units on the market are now virtually maintenance-free. ASTRA-GLAZE-SW®+ glazed masonry units by Trenwyth have new built-in protectants which act as an invisible shield - virtually impenetrable by spray paint, permanent markers, grease, or crayon. Graffiti and dirt wipe clean easily, making ASTRA-GLAZE-SW®+ glazed masonry units the perfect choice for your institutional, commercial, or industrial project. ASTRA-GLAZE-SW®+ units provide finished load-bearing or non-load-bearing walls in a single trade, one-step operation. You save time and money. Special proprietary formulations create an impervious, sanitary, and chemical-resistant facing approved by the USDA. Magic marker, spray paint, grease, etc. can be easily removed. The satin finish will last the lifetime of your building and eliminates the need to repaint or refinish. Using the most up-to-date technology, ASTRA-GLAZE-SW®+ units provide outstanding color-fastness. Plus, built-in ductility reduces the possibility of cracking and crazing in adverse conditions. ASTRA-GLAZE-SW®+ units offer you freedom of expression in design through a variety of colors, shapes, and scoring patterns. Custom color matching is available to meet your design needs.